This watch is also known as: GTQ000YGGA099C , GTQ000-YG-GA099-C , GTQ000.YG.GA099.C . The Delaneau "Three Time Zone" Model # GTQ000 YG GA099 C is truly one of the most elusive watches that Delaneau has ever produced. With its intricate design and imaginative ideas, this Delaneau "Three Time Zone" Model # GTQ000 YG GA099 C is sporting a three time zone with its 2 small Quartz clock extended at the bezel going through the bracelet. Meanwhile, this Delaneau "Three Time Zone" Model # GTQ000 YG GA099 C uses an Automatic movement mechanism on its main time piece and is encased in an 18kt Yellow Gold. This intricate timepiece has a case diameter of 36.75mm and is sporting a Mother of Pearl face dial. With its intricate measurements both on the dial and on the bezel, this Delaneau "Three Time Zone" Model # GTQ000 YG GA099 C has showcased the beauty beyond its complexity. Attached to a black leather strap this precious timepiece is secured and protected by a traditional 18kt Yellow gold adjustable pin and buckle. 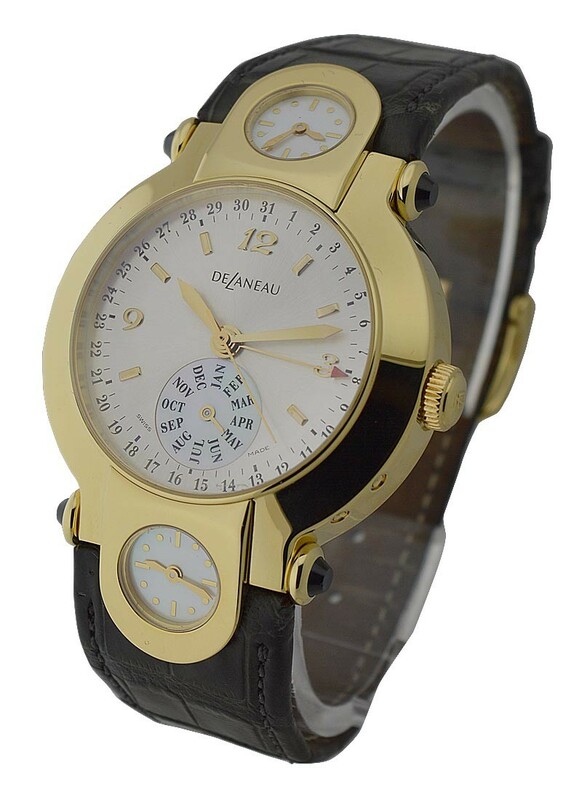 * https://www.essential-watches.com/ sells only 100% Authentic Delaneau watches, but is not and does not claim to be an Authorized Dealer of ANY brand advertised on our website including Delaneau. 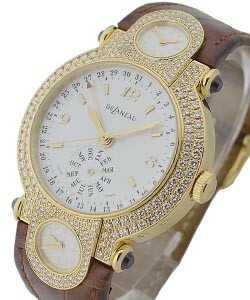 Because we are not an Authorized Dealer for Delaneau, we can not advertise their watches as "brand new". For all intents and purposes, the watches we sell are USED, but are in immaculate - perfect - never sold condition. We specialize in discounting only the highest-grade 100% Authentic Swiss and German timepieces. We trust these timepieces to be of such high caliber that we warranty all "unworn condition" watches for a period of 2 years unless it is sold as a used watch, and in that case, you will receive a 1 year warranty. You CAN NOT expect and WILL NOT receive the factory Delaneau warranty on any watch we advertise. We are the sole warrantor of ALL Brands sold on our website.